Westgate Chapel07729108385work ChurchThe first Westgate Chapel was dedicated on 29th August 1697 by Oliver Heywood. It is the first place of worship built in Wakefield since the reformation. The current building is the oldest brick building in Wakefield. In 1717 wainscoting bearing the date 1590 as well as two stone gate posts surmounted by stone balls were brought from Howley Hall. Not a trace of this Tudor panelling survives alas. The chapel, internally it was fitted out with box pews, and on 26th June 1737 a new pulpit was erected, which was moved in 1752 to the current building. The first chapel evidently had a gallery, as the façade for the gallery was moved again to the new building, along with the box pews and wall panelling. Also moved to the new building was the bell, so clearly the old chapel had a bell tower of some sort. Trustees were appointed 25th December 1735 to manage the chapel. The deed stated that the chapel was: ‘a meeting place or house for praying preaching and Exercising Religious Worshipp in by Protestant Dissenters and to and for none other use Intent or purpose Whatsoever’. A manse was erected in 1741. The chapel was opened on 1st November 1752 by the Rev. Thomas Walker M.A. the minister at Mill Hill Chapel Leeds. He was a radical, and very much an Arian if not proto-unitarian. He denied the divinity of Jesus, denied the trinity and we are left in no doubt that his theological unorthodoxy was mirrored by the congregation then as much as it is today as the trustees published sermon in 1753. It would be Walker who between 1748 and 1763 that moved the congregation at Mill Hill, then the principal place of Nonconformist worship in the area towards Unitarianism, a process completed by his successor, the famed Dr Joseph Priestley, whose ministry at Mill Hill lasted from 1767 to 1773. The chapel interior and exterior remained pretty much as they were since 1752 through to 1880. Side galleries had been erected in 1792 and a coke stove installed. An organ was installed in 1848. The chapel of today, is much as it was left after the restoration of 1881-1882: the brain child of the Rev. Andrew Chalmers. No major changes to the chapel have taken place since 1882. The manse or parsonage was sold in 1892, but still stood until the early 1970’s, latterly as the Cornhill Commercial Hotel, when it was demolished to make way for a municipal car park. The site is now occupied by the ‘Family Court’ building erected in recent years. The Orangery was sold in 1991, the funds used to extend the vestry to provide two toilets and a kitchen. In 1995, a lectern was purchased as a memorial to chapel members. A new sound system and carpeting were installed in 1997. The first Westgate Chapel was dedicated on 29th August 1697 by Oliver Heywood. It is the first place of worship built in Wakefield since the reformation. The current building is the oldest brick building in Wakefield. From 1700 to the outbreak of the Great War, men and women of Westgate Chapel took a leading part in the social, economic and spiritual development of Wakefield. The Milnes, Naylor’s, Lumb’s, Heywood’s, Briggs and Marriott’s dominated the economic development of Wakefield and area. Chapel women ran their own business, agitated for social reform and female suffrage as well as animal welfare. Beneath the chapel lie four MPs -James Milnes MP for Bletchingley, Richard Slater Milnes MP for York, Benjamin Gaskell MP for Maldon, Daniel Gaskell MP for Wakefield. The chapel is furthermore associated with other MPs, Rawdon Briggs, first MP for Halifax, James Milnes Gaskell MP for Muchwenclock, Charles MIlnes Gaskell MP for Morley. The father of Sir Robert Shore Milnes, governor of Martinique and thence Deputy Governor General of Canada 1797-1805 lies in the catacombs. Dowager Duchess Galway, widow of Lord Galway MP for York 1784-1796, and Pontefract 1796-1804. The congregation was instrumental in foundng the Yorkshire Association for Political Reform in 1779. Chapel members were supporters of the French Revolution and were called 'Jacobins' or 'New Cromwellians' for their Republican ideals. Mary Gaskell, wife of Daniel Gaskell was a friend of Mary Shelley, who often visited Westgate Chapel. As did William Ewart Gladstone the Primeminister, Guiseppi Manzini the hero of the Italian Resorgimento, William Wilberforce, Thomas Day the founding father of the abolitionist movement. Here attended one of the tutors of the Bronte family, and his grave can be found in the chapel yard. 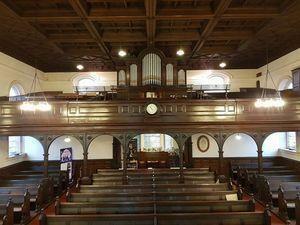 The Chapel was the most influential Nonconformist meeting house in the north of England. Indeed 12% of the cloth trade of the country passed through the hands of chapel members. Tours of the chapel and catacombs are illustrated with portraits of past chapel members.